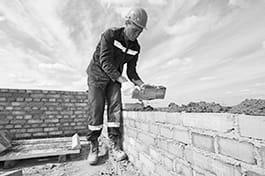 Construction bricklayers lay and bind bricks, pre-cut stone, concrete blocks and other types of building blocks in/with mortar and other substances to construct walls, foundations, partitions, arches and other structures. Analyze and interpret work orders, e.g. study drawings to determine specifications and to calculate the materials required. Measure distance from reference points and mark guidelines to lay out work, e.g. using plumb bobs and levels. Lay courses of bricks and other building blocks, from corner to corner, using mason's line. Break or cut bricks and other building blocks to size, using tools such as trowel edges or hammers. Mix specified amounts of sand, clay, cement or mortar powder with water. Apply and smooth mortar or other mixture over work surface to serve as a base and binder for bricks. Fasten bricks or other building blocks to structure, for example with wire clamps, anchor holes or cement. Remove excess mortar, e.g. with trowels and hand tools, and finish mortar joints with jointing tools for a sealed uniform appearance. Use a trowel to apply extra mortar to joints to smoothen and finish them after the mortar has partially hardened. Make sure that the joints are full to prevent dampness and other outside influences from passing through the wall. Use the appropriate tools to trim, split and shape bricks for use in walls. Use a mason's hammer for occasional shaping, and a hammer and chisel for larger quantities or when the split has to be especially straight. Lay bricks in the specified pattern and apply a layer of mortar to create walls. Make sure every course of bricks is level and flush. Mix construction materials with water and other materials based on the appropriate recipe. Mix thoroughly to prevent lumps. Avoid contamination, which will adversely affect the properties of the mixture. Use tools such as the level or the mason's line to check if the wall is straight and flush, and take action it isn't.